With the decline of the honeybee and colony collapse, I wanted to do my part to help the environment and food sources. 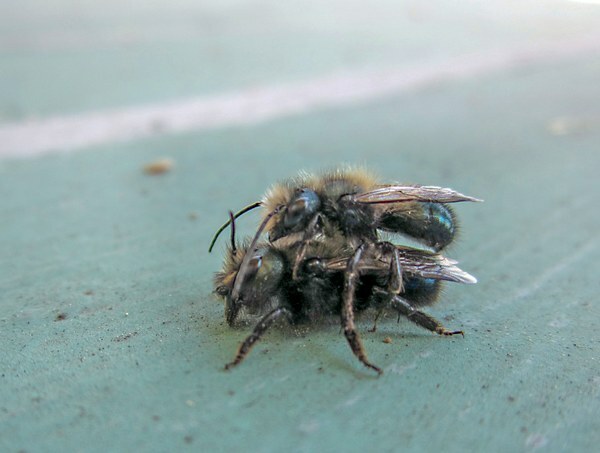 Here's what happened when I put mason bees on my property. Super Volunteer & "Bee Mama"
I had three Asian pear trees that were in decline. They weren’t producing much fruit and what did grow, didn’t have much flavor. I thought honeybees might be the answer. Mason bees are sometimes referred to as orchard bees, because of their super pollination power in the orchards. He told me that honeybees wouldn’t be able to help with the second reason because they tend to be active long after fruit tree blooms have fallen off. He asked me if I had heard of mason bees. When I said no, he said I should do some research and that these bees were also called orchard bees since they are beneficial to pollinating vast orchards. You need around 60,000 honeybees to pollinate the same acre of fruit trees as only 400 mason bees! I ordered nesting tubes, liners, and natural reeds online, and picked up 25 cocoons from Crown Bees in Issaquah. When I got my cocoons, I put them in my fridge until it was time to put them outside. I put the nesting tubes in a long can and hung it from one of the pear trees. Once the trees started blooming, I put the box in the can and waited for the bees to emerge. Unfortunately, they didn’t like the location and immediately flew away. Not to be deterred, I ordered 50 more cocoons from Crown Bees, along with a bee house (instead of a can). I also did more research and found that I should place the house/tubes/cocoons in a south or southeast location, so morning sun can warm the bees. I also needed to create a mud source (clay based, not sandy) nearby. I have a wrap-around covered porch that was perfect. Plus, birds never seem to fly under the porch roof, so I thought the bees might be more protected than in the trees. It was a good choice! My bees emerged and got busy! Watching the bees was so fascinating! At the end of September, I removed and opened all the tubes. One of the books I had purchased said to look for parasitic wasps and mites. I found two of the wasps, but very few mites. The book also said to rinse the cocoons in a colander (they are waterproof), then put them in a mild bleach solution (1 tsp. bleach to 4 qts. of water), then remove them to a white paper towel to dry. If there were any yellow or orange stains on the paper towels, then mites were still present. I was lucky and had none. All in all, I had over 400 cocoons! Once the cocoons were dry, I got a plastic container and placed a wet paper towel in the bottom. You need some moisture since modern refrigerators have very little humidity. This container also had an insert, so I could separate the wet towel from the small box that contained the cocoons. Closing the lid, I put it in my refrigerator for the winter. The following year, I felt like a proud mom! All but about 40 of my harvested cocoons hatched! 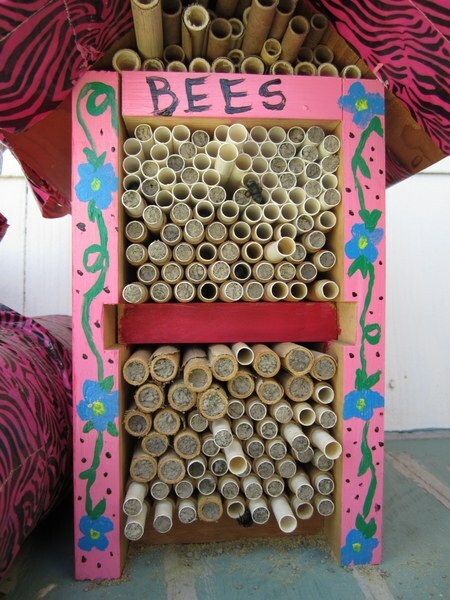 I added a nesting block from Crown Bees that year, instead of the cardboard tubes. I found it allowed for quicker harvesting and clean-up. Since my start with mason bees, I typically harvest over 3,000 cocoons. My Asian pear trees are producing bumper crops and taste sweeter than ever (I get so much fruit now, I donate 75% of the pears to City Fruit). I’m still just as fascinated watching the bees at work each spring. They only take me about 30 minutes of work each year and now that I’m harvesting my own cocoons, I don’t have any additional expenses. If you are interested in raising your own pollinators, I recommend reading Mason Bee Revolution by Dave Hunter and Jill Lightner, sold by Mountaineers Books and in the Seattle clubhouse store. Dave's company, Crown Bees, is also a good place to watch tutorial videos. You can also learn more about bees and other things in the NATURALISTS classes and study group lectures. Something I learned....using a wood block with holes drilled in it isn't a good idea. If one of the cocoons towards the front isn't viable, all the bees hatching behind it can't get out, so they die. Best to use blocks like the kind Crown Bees sells (plus, they are easier to harvest than tubes.